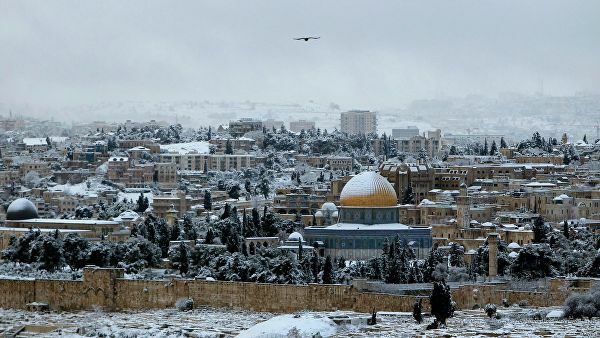 The first snow in four years fell on the eve of Jerusalem, in the city there was established, by Israeli standards, a real cold – minus two degrees. Portal Ynet published a video on Thursday, which shows that severe frost and snow did not stop Israelis who wished to pray the day before at the Wailing Wall. To warm up, they staged a dance in front of the Wall, which was covered with snow before their eyes. Residents of Jerusalem post photos on the social network. They made snowballs and rejoiced at the snowfall, which has not been since 2015. Snow cover remained on Mount Hebron and in the Golan Heights. Many Israelis, hoping to see the snow, went to the Golan and the Upper Galilee. As reported by tour operators, on January 17-18 all the available seats in the hotels of this region are sold out. The photograph covers the territory near the border of Morocco and Algeria, to the south of the city of Boufar and southwest of the city of Ain Sefra. Waiting for a snowstorm in the north and in the center of the country, about which forecasters warned the day before, all the rescue services of Israel were alerted number one, even fire engines were equipped with special chains in case of ice. On many highways, traffic was reportedly blocked due to strong winds that poured trees and poles. According to data released on Thursday by the Electricity Company, a record of electricity consumption in the country was broken last night. On Thursday, the Jerusalem Mayor’s Office announced that the city had completely returned to normal, no incidents were recorded. Next story Physical activity will help improve memory and brain function.